Will my child learn about ocean safety? This is the lesson we take most seriously. Every day, before the kids get in the water, each group reviews safety procedures that apply to the water and the beach. Our instructors also teach the kids how to appreciate the ocean environment. If kids are not following the proper safety procedures, they are pulled out of the water and must review the rules again. What does my child need to bring every day? All the equipment is provided (surfboard, water-shirt, wetsuit, drinks). Each participant should bring: bathing suit, towel, sweatshirt, sunblock, sunglasses, hat, footwear, and a hearty snack. What do the kids do if there is no surf on a particular day? We have a variety of water games and beach games for the kids to participate in. The kids can also go snorkeling in small groups with an instructor. It is very rare for there to be no surf at all. What do the kids do if the surf is too big? We never put the kids at risk. On bigger days, if the conditions permit, the kids surf the whitewater waves close to the shore. If the staff feels that the conditions are unsafe, we will work on their surfing skills on the sand, as well as play beach games. How do I know if my son/daughter is ready to learn how to surf? If your son/daughter has intermediate to advanced swimming skills and has experience swimming in the ocean, then he or she is ready. Beginners always start on small, whitewater waves near the shore and can touch the ground with their feet. We never push anyone to surf if they are not ready. We provide body boards to the kids who would rather take their time with surfing. Our goal is to slowly encourage them to give surfing a chance in a positive manner. How much time during the day will my child be surfing? Your child will be in a group with three other participants and one instructor. The instructor will be in the water with them the entire time. The entire camp session is dedicated to being in the water surfing, with the exception of a one half hour break in the middle of the session. Please note, we do not force the kids to surf. We constantly encourage them to get in the water and surf as much as possible, although we do not believe in forcing them. From our experience, once you force them to get in the water, it defeats the purpose of making it a fun environment and progress will be delayed. Who will my son/daughter be grouped with? Ultimately, we let the kids choose what group they want to be in. It usually turns out that the girls want to be with other girls, or they want to be with friends, or someone in their own age group. We are very flexible and will organize the groups the first 30 minutes on the first day of camp. 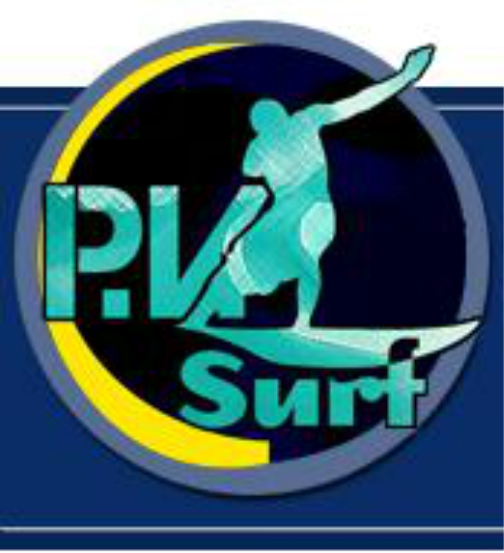 Does PV Surf offer private lessons? Yes, please refer to the "private lessons" page on our website. Does PV Surf cater birthday parties? Yes. The ratio of instructors to kids is 3:1. The kids will learn the important water safety techniques, as well as surfing skills. All of the equipment is provided (boards, water-shirts, wetsuits). We also can provide food and drinks upon request. The cost for each child is $50 per hour. The food is extra, but no charge for delivery.